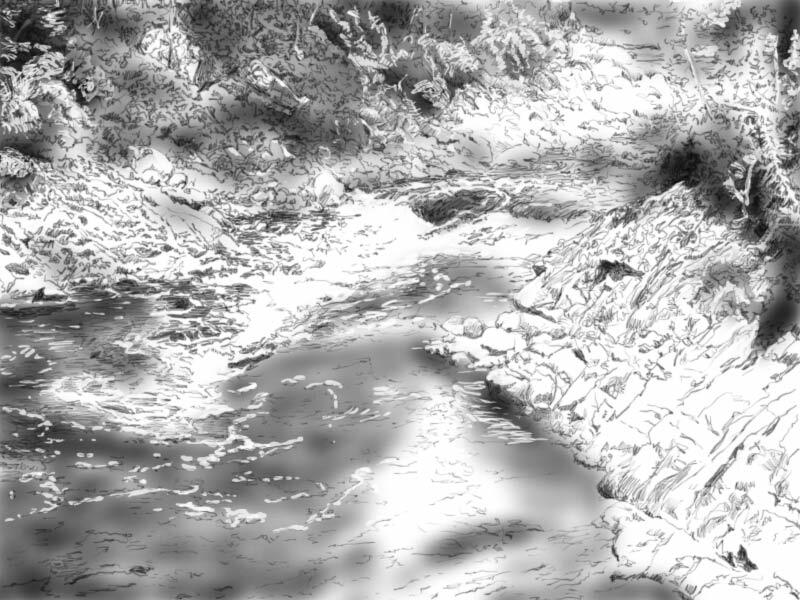 "Pinware River 3, Labrador - Rapids"
I realized as I was completing this drawing that a rapids is a waterfall inside a river. Wow! For computer drawing, I use a digitizing tablet and stylus, and a graphics software that lets me use layers. In this drawing, I used one layer for the black lines, another layer for the airbrush gray spray and a third layer for the white background. Keeping each component separate simplifies how I work. When I have finished the drawing, I flatten all the layers together and save the drawing in its final format to use online. Wow, your drawings are amazing! I just found your blog through AEDM, and can't wait to see how they progress to a painting over the month. Really cool! Hi Jen: Thanks for checking out my blog and for your comments. I find that doing these preliminary drawings helps me to observe the little details that will go into the painting. I am really glad that you will come back to see how the project is developing!